Albero Amico - of the namesake yard - tells us something about refitting. There were about '91 or '92 years, when Genoa lived a rather markedly economical and social depression; the port was run by old and patronage corporations and languished although it had all for making it works well. Running the yard in those days, Alberto Amico guessed something resulted in a brilliant idea then. 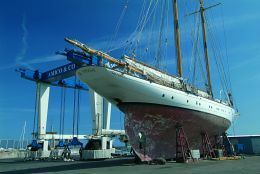 Starting from the consideration that hundred of very great yachts, super - and mega yachts, had been built all over the world and after years of navigation and working they had to be subject to be a sometimes very expensive maintenance, Alberto invented as first in Italy "refitting", namely the restoration and transformation of those vessels. He did his best for organizing spaces and working disposition and after 10 years of constant working at, he won a bet with himself: eradicate the bias against Italian shipyards judged low qualified and unreliable. From the beginning the Amicos addresses essentially to foreign markets and has achieved step by step a great satisfaction and formidable reputation among experts. Their typical customer is either a private man who brings them his yacht for refitting, grows fond of and comes again or professional men, managers in nautical field, captains and foreign agencies which rely to a yard in effort on giving their customers an efficient service. The work is assigned on fixed basis contract according to such criteria as reliability, quality, time and cost saving as well as relationship with the yard. 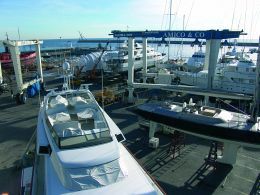 Amico is able to quote a percentage of more than 50% contracts right thanks to the fine and qualified services given. The growth rate amounts to roughly 20 - 30%, slowing down in the last two years because of reorganization. 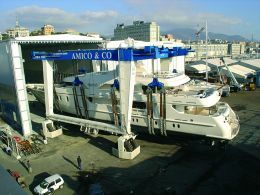 At present Amico quotes quite maximum allowable increases either due to the less space available in Genoa today or because becoming a too big production yard could mean loss in quality. 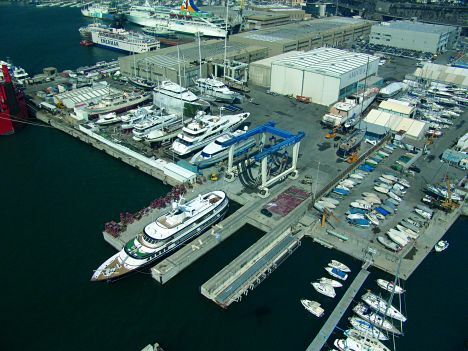 The yard counts 12 separate, covered, fully air - conditioned areas, 30.000 square metres, a dry dock for ships up to 200 metres, a Syncro crane of 200 tons, a Travel1 one of 300 tons, a Travel2 one of 510 tons and 10.000 square metre quays without limitations: so an industrial organized structure comprises a handicraft nucleus of high quality too. 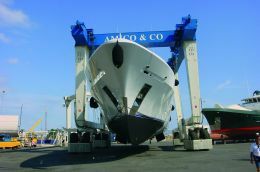 The working skills are so high that, for instance, a 50/60 metre yacht is put in the destination shed and only 6 hours after her arrival treatments can begin saving consequently both work and deliver time. So Amico is able to quote competitive prises for primary services in amount of 40-50% in comparison to Spain or France, not having such structures. Inside the yard there is a fully independent technical managing team of six members and several worker teams extremely specialized in making all kind of treatments necessary for. 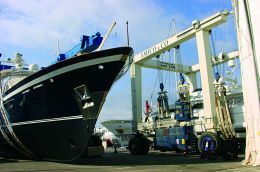 About fifteen external firms are teamed up inside the yard with their own spaces for guarantying a top - quality level and continuous availability. The immediate advantages of such a working organization is a constant quality and work time control making for a service suiting to standards required outland. 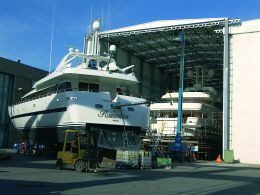 Despite refitting and restyling varnishing new yachts takes consistently part of the income amount. Concerning sheds maintenance, they are cleaned up and sucked up for keeping away all parts able to ruin varnishing. 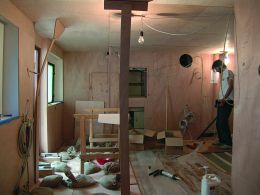 Then after, plastering and varnishing are made in controlled atmosphere. So all in all, a big, fine - organized yard can't mean more expensive costs than those of a small one. 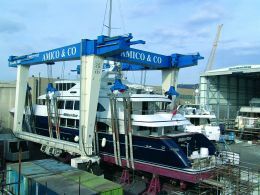 The fine - organized Amico's yard can offer a cheaper, faster and more qualified service than this given by a small craftsman without means and structures necessary for. In fact here the craft manlike activity and quality are transferred to an industrial level even maintaining the high autonomy of a single craftsman by mean of a control hierarchy of only two steps. Also maintaining fishing ships and tug - boats belongs to. Talking about working phases we can actually say the working sequence is listed as follows: 1) to give glance to the yard, not much by mean of advertising but above all by mean of constantly taking place in international events as well as by mean of contacts with captains and the very good reputation resulting from quality. 2) Correct, complete and clear estimates. 3) To give a detailed description of all treatments at in effort on reassuring the owner. Then organization, work and cost - efficiency control; finally sea trials, namely floating and stability trials for certification. It often happens a committee consisting of an engineer, the designer, a joiner, a varnisher, an electrician and an installer leave and study in detail treatments world - widely where the yacht is. 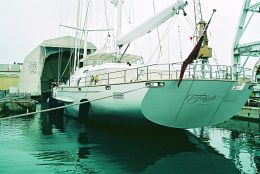 Now let's talk about what actually "refitting" means: to take a big yacht in, to dismount her quite totally, to redesign interior, exterior and installations; then after to rebuild, to test and certify her in so far is quite difficult to operate, rethink and rebuilt manufactures of others. 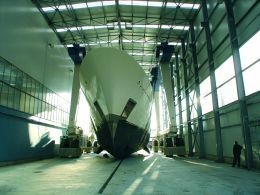 Franco Cattai, production manager, for instance, tells us of a great, in record time made, refitting of a 40 metre Benetti in 1971 at which he worked as Project Manager. 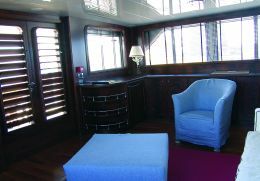 All in all the yard has refitted four staterooms, two saloons, five bathrooms, crew's cabins providing them by new electric and hydraulic installations, cycling or direct conditioning air, fire protection, and electronic package; 20% of iron replaced, a second emergency exit for fire alarm; anti corrosion and sandblasting treatments to tanks, interior rebuilt including tapestry, and MCA classification for a total of four months of working at. Interior design is by Matteo Thun studio in Milan teaming up with the owner woman, who has in some way aesthetically imprinted the refitting. It has been chosen a classic contaminated minimalist touch with modern and essential lines matching styling elements. 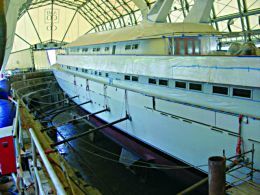 Now let's look at the sequential stages of treatments: the yacht is at yard and the project is ready to be realized, so all structures to be replaced or repaired are dismounted and brought ashore. Teams of carpenters, electricians, plumbers, joiners and installers, leaded by a prime contractor coordinating and controlling all working stages, begin to adapt the project to the hull. All treatments concerning refitting are realized in - house including interior design or furniture (this is not the case). The three main and more interesting treatments to have concerned the owner's suite with its private bathroom and the galley, as well. All these areas have been fully disembowelled from floor to ceiling. 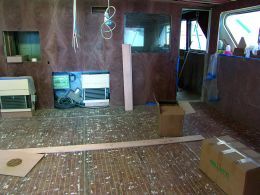 Owner's stateroom: filling and panelling of walls, floors and ceilings have been replaced, and working at is right ended after having ultimate electrician and conditioning system installations. In this refitting has been used mahogany plume as wall coating material. This kind of wood, usually sold in lots of low laminates, has been expressly chosen at the supplier by a committee of yard's joiners, owner woman and designer. 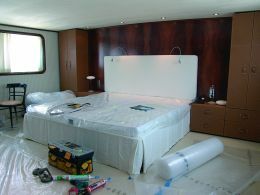 For coating ceilings has been chosen fabric while moquettes is over all floors. 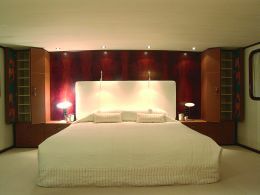 The bed has been built in mahogany plum while furniture coated by leader and decorated inside. Owner's private bathroom: according to an aesthetic feel the designer has chosen also in these area the hot and flamed tones of the mahogany plume for the walls. The big shower box has been finished with panels in temperate glass and varnished behind for giving a fine - translucent lightness. The frames between panels as well as all metal surfaces on board are in solid chrome - plated brass. Taps are original English. Spectacular is the basin sculpted in a solid onyx block properly looked for. By sculpting this, a wise craftsman has made possible to achieve onyx veneers converging towards its centre. 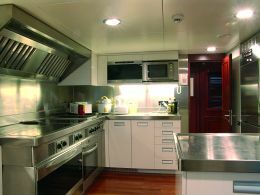 Galley: after having replaced all installations and filled walls and floorings (varnished walls, teak floor and ceiling with lacquered panels) it has been fitted up three ovens (1 steam - oven, 1 traditional one and 1 extra - large one), a micro wave oven, 6 induction cook tops, 1 barbecue one, a sleek designed cowl, 3 fridges for wine, a refrigerator and a freezer in stainless steel, as the present trend requests. 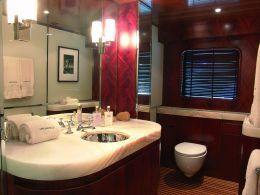 Very interesting are also treatments to the fly deck in mahogany plume and to very elegant guest bathrooms. Noteworthy is the VIP cabin, in which an emergency exit is right discretely recessed in a wall. Also an external spiral staircase joining the two decks has been fitted up.